Beryl Cook died a week ago and nobody told me. 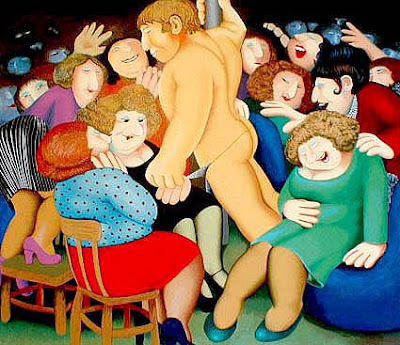 Artist Beryl Cook, known for her colourful and comic paintings of larger-than-life ladies, has died at the age of 81. She died peacefully at her home in Plymouth on Wednesday with her husband and family at her side. Cook had no formal training and did not take up painting until her 40s, but her work went on to become hugely popular. i don't know why I haven't come across this before, as it's been up a few years to judge from the fact that it links to my old defunct website. It's at tomwaitslibrary.com, a whole page listing all his lyrics, comments and other people's observations on his 'Eyeball Kid' character that pops up in a couple of different songs, and specifically the ways in which it relates to Eddie Campbell's Eyeball Kid (with half a dozen colour cover illustrations, some of which you may not have seen before. Tom Waits: "The Eyeball Kid is a comic-book character. Actually, it was Nic Cage that reintroduced me to comic books. I hadn't thought about comic books since I was a little kid, but he seemed to carry that mythology with him. It was inspiring to see him keep alive some of those principles that we associate with childhood, to the point where he named himself after Cage, the comic-book hero." And in 1999 some people talked to Waits for a while after his New York shows: "Alex asked Tom if there was a relation between the Eyeball Kid of the song and the character in the comic book Bacchus by Eddie Campbell (which I've been told - if I remember correctly - is based on Greek mythology). Tom told Alex that yes, when he saw that he became fascinated by the idea of a character with no body and was inspired to do his own version, very different but that's where he said it came from!" No, she wasn't actually staggering around the hallowed halls. But a Cambridge English professor caused quite a stir last week when a question on his final exam asked students to compare the poetry of Sir Walter Raleigh (1552-1618) to song lyrics by Bob Dylan, Billie Holiday and, you guessed it, Amy Winehouse. The British press is still buzzing about it, with critics accusing the school of dumbing down its exams and focusing particularly on Winehouse--one of their favorite targets. What was the drug-addled starlet's work, they asked, doing in a Cambridge English class?